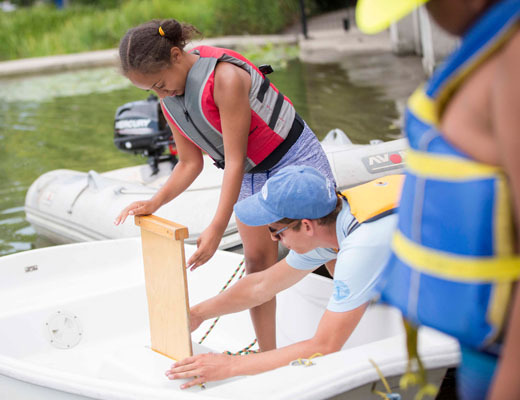 The Junior Sailing Program was developed to teach sailing to eight- to twelve-year-old Chicago inner-city youths. The fleet consists of Vanguard Prams, 7′ 7″ boats, widely used throughout the world in teaching beginners how to sail. The Program is located at several of the beautifully renovated, city water-fed lagoons. The environment is unequaled and is an extremely rare experience for a big city recreational program. This unique approach brings the program to the neighborhood rather than the neighborhood to the program. 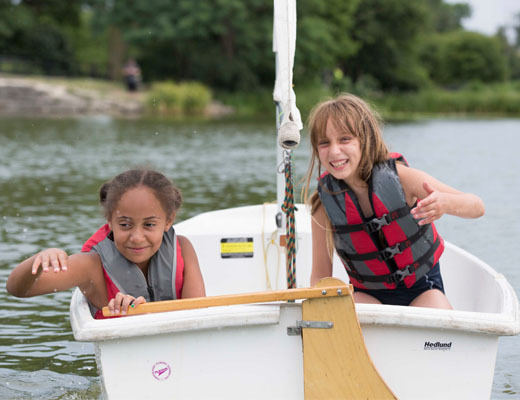 Like the Judd Goldman Adaptive Sailing Program (JGASP), the Junior Sailing Program is a public/private partnership with the Chicago Park District. The Foundation raises funds for instructor salaries, boats and maintenance costs while the Park District is responsible for the infrastructure. Our goal for inner-city youth is identical to our JGASP mission …helping people to achieve self-esteem and independence. Campers attending the Chicago Park District Summer Camp have lessons exclusively from Monday through Friday. The hours are 1:00 p.m. to 3:30 p.m.
Take I-94 W to exit 49B, Milwaukee/Augusta. Turn right at N. Milwaukee Ave. Slight left at W. Division St. 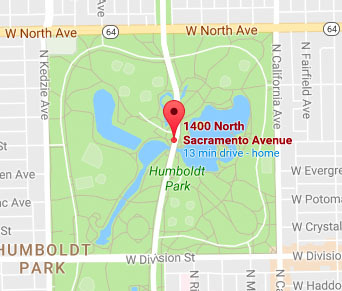 Turn right at Humboldt Park Drive. Take Tri-State Tollway/I-94 S ramp to Chicago. Take exit 46A to merge onto N. California Ave. Turn right at W. Armitage Ave. Turn left at N. Humboldt Blvd. Continue on N. Humboldt Dr.
Take I-290 E/Eisenhower Expy E to I-294 S/Chicago. Take exit 27A for Sacramento Blvd. Turn left at S. Sacramento Blvd. Continue on Humboldt Dr.
Take I-94 W to exit 51H to merge onto I-290 W. Take exit 26B toward Homan Ave. Merge onto W. Congress Pkwy. Turn right at S. Central Park Ave.
Take Tri-State Tollway/I-94 S ramp to Chicago. Take exit 51H-I to merge onto I-290 W toward West Suburbs. Take exit 26B toward Homan Ave. Merge onto W. Congress Pkwy. 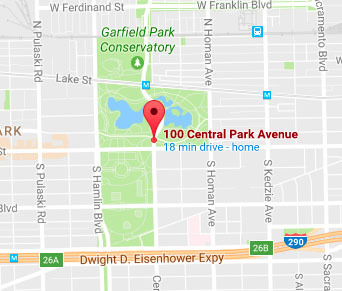 Turn right at S. Central Park Ave.
Take I-290 E/Eisenhower Expy E to I-294 S/Chicago. Take exit 26A toward Independence Blvd. Merge onto W. Harrison St. 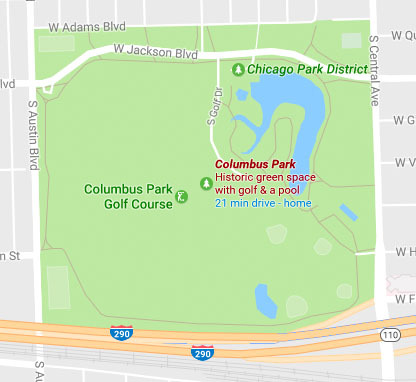 Turn left at S. Central Park Ave.
Take I-94 W to exit 51H to merge onto I-290 W. Take exit 26B toward Homan Ave. Merge onto W. Congress Pkwy. Turn right at S. Austin Blvd. Take Tri-State Tollway/I-94 S ramp to Chicago. Take exit 51H-I to merge onto I-290 W toward West Suburbs. Take exit 26B toward Homan Ave. Merge onto W. Congress Pkwy. Turn right at S. Austin Blvd. Take I-290 E/Eisenhower Expy E to to S. Austin Blvd.